Drying Ink: Guest Post: Series or Stand-Alone Novels? I seem to be drawn to the series. I love how some people are just magnets for adventure, trouble, and danger their whole lives. Another attraction to series for me is the familiarity with the character(s), watching them change or evolve over time through the books along with understanding the world and the rules that are in place. Yet, there are a few series that are in the same world but with different characters in each book. I am guessing you may see the old characters once in a while to help and such, but I have not read any series that are strictly like this yet. I know all characters' time comes to an end at some point. The wars and battles can’t last forever and they need to complete their life cycle and pass on (most of them anyway). Right? So do the characters complete their mission or die with the series end or does the torch get passed to another gifted replacement or to a different angle? I don’t know if you would consider all the books by Ramond E. Feist series’. I have read the books from Magician: Apprentice all the way up to Shards of a Broken Crown. These books showcase the same world. These books have series in them with the main characters and then have stand alones of the children, and series of where the torch is passed down to new characters and children to complete the goals set. I am afraid after too many books a series may become repeatish or formulated. I don’t want to lose that spark that is there; in the world, characters, and all of it mixed together. Some stand alone novels, and I know this does NOT hold for all, feel rushed to get the details of a new world in and the story. Although, I have read stand alones that exceed this prejudice with ease. I like reading stand alones in that there is a goal or job to be done and in the end it is all taken care of, the result may not be what I thought it would be but the job is complete, and the world is then back to normal. The nice thing is you don’t have to wait to find out what happens and you can move on to a new world next. 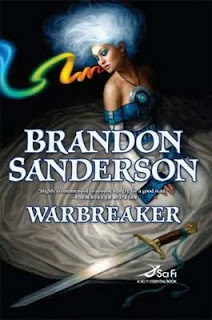 An example of a very good stand-alone novel, which creates a world, new magic system, and character development, is Warbreaker by Brandon Sanderson. There are also many great stand-alone novels that use our world as the world base, which helps so they can spend more time on the characters and plots. I do have to say I love my series and hate to see them end, but all good things must come to an end. Thanks for posting this! It looks great. 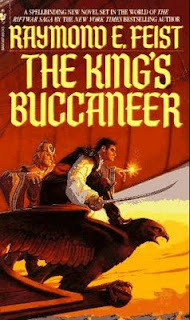 I do have to say I love the cover of The Kings Buccaneer. The one I have is not as nice. I wish I had that one though. Thanks again! I prefer stand alone novels. I will read a series if and only if each book can stand by itself. Cliff hangers at the end of a book are a sure fire way for me to abandon a series in disgust. @Pussreboots: Usually, I'd agree - but some series are compelling enough for me to neglect my usual instinct. Just look at Dust of Dreams - the limits on book size forced a cut, and that does leave a certain cliffhanger - but I thought the conclusion fantastic nonetheless. Most of the time, though, I totally agree! Pussreboots, I truly understand the cliffhanger thing. I really hate that. If the whole series is out and done, then it doesn't bother me as much because I can keep reading. But with new series I hate this because I have to wait for I don't know how long for the story to get completed and by then I forget what it was that was happening. Although, I have read a few series that this was well worth the wait as well. It is all in what you like to read. Thank you very much for stopping by and commenting. I have to say I like both, I like the way a good stand alone novel makes you feel like it is complete, and finished. I have read some stand alones that seemed like they needed a sequel, though. I am a huge fan of a few series. A couple are churned out at a book a year, so I don't have to wait long for the continuation, but these could be read alone because the plot is generally resolved by the end of the book. One series; however, has very long books, highly developed characters, twisting multiple plots, and usually leaves a cliffhanger. The author takes her time researching, and publishing new books, but when they finally do come, I am stoked! I adore the characters, and feel like I am returning to hang out with some old friends. She never leaves me disappointed! A great, stand-alone novel from Raymond Feist is Faerie Tale. Perhaps his best book. Very dark. Hm, I haven't actually read that one. I'll give it a go once I've finished my current TBR pile. You know I haven't read Faerie Tale either. 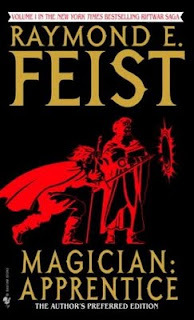 My brother suggested Feist to me when I was looking for something good to read. And I always meant to try this book. I know I've talked to my brother on this, but I can't for the life of me remember what it was he thought of the book. I will have to give it a go at some point. :) Thanks!